The actress is not interested in joining politics. She talks about her favourite actresses and her opinion on writing an autobiography. Mumbai: No sooner did Madhuri Dixit Nene enter the film industry, her beauty was compared to Madhubala. No prizes for guessing that ‘The Venus Queen of Indian Cinema’ is also Madhuri’s favourite. “I love Madhubala for her effervescence. Meena Kumari and Nutan both got such lovely roles to play in that era, I was fascinated by them,” says Madhuri when asked about her favourite yesteryear actresses. Apparently, the actress has also been approached to do the biopic of another yesteryear’s actress Suchitra Sen. The 51-year-old actress is doing well in her second stint with Bollywood. While she made her Marathi debut with Bucket List last year, this year saw her turning into a producer with August 15 for Netflix. 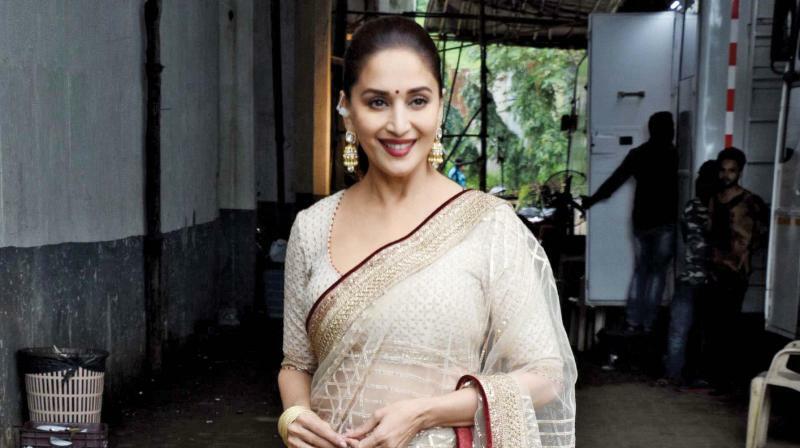 Now, Madhuri is set to surprise the audience with her performance in Kalank, which is set to release next week. Madhuri’s professional and personal life, especially the way the actress has conducted herself in the industry has been very inspiring. Would she like to pen down her autobiography? “I have not given it a thought. It’s too early to say whether I will write an autobiography,” she says. And, what about joining politics? “I have already said no. I am not interested. If you want to join politics, you should have an interest as well as knowledge. If actresses are joining politics — why not? If they have the aptitude, they should do it,” she concludes.